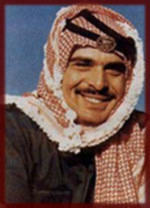 This site is designed to be a living tribute to the legacy of King Hussein, the father of modern Jordan. During his lifetime, he brought the wisdom to walk in the path of honour, the courage to follow his convictions, and an abiding compassion for others. He enriched us all by the nobility of his spirit. We hope that this site will contribute in some way to reflecting the vision to which he devoted his life. Please join us in furthering his legacy.